George Wilson Sr., long-time owner of Wilson’s Bar-B-Q on the Northside, died on Sunday, Oct. 28 at the age of 90. In this 2016 profile of the popular establishment, The Northside Chronicle talked with Wilson Sr. about growing up in Hansley, Louisana and Little Rock, Arkansas, the key to running a family business for over 50 years and what he would and would not disclose about the ingredients in his special barbecue sauce. George Wilson Sr. stands beside the smoker at the Central Northside barbecue shop that bares his name. You can smell the sweet, smoky scent of old-fashioned ribs from nearly three blocks away. There’s no mistaking the aroma, inching closer, you can nearly taste the smoke-infused flavor of deliciousness. By the time you get to the corner of Central Northside’s Taylor Avenue and rip open the screen door you’ll realize that Wilson’s Bar-B-Q is the real deal. You’ll likely catch a member of the Wilson family turning over hot embers and restocking the firewood or pulling out a juice-dripping rack of ribs for a customer as you step into one of the most famous barbecue joints in the city. Wilson Jr., is currently being groomed by his father and current owner, George Wilson Sr., on the ins and outs of the barbecue world. “When you [have] all family [working] you can pretty well deal with them knowing that they know what I know,” Wilson Sr. said. The elder Wilson, who turns 88 this month, has been serving up delicious ribs to hungry yinzers since 1960. His ribs have brought in the likes of NFL Hall of Famers Franco Harris and Lynn Swann and have been featured in a number of publications over the years, even LIFE magazine. He originally opened up in the neighborhood of Manchester before moving to his current location near the Mexican War Streets at the start of the 1970s. “If you don’t do it right, don’t do it, and that’s the way we are,” Wilson Sr. said. Photo by Neil Strebig: Wilson’s ribs have been the stable of the business for 60 years. Wilson Sr. grew up in Hansley, Louisana and Little Rock, Arkansas where his father and grandfather entrusted him with their family’s barbecue recipe. Wilson passionately recalls the trio’s trips to Texas in his younger years; trips that sparked the passion behind the family business. Although, Wilson Sr. is proud of his six decades in business he is equally boastful of his culinary prowess. Before he and his father opened up their Manchester location in 1960, Wilson was a butcher and “meat fabricator” at Armor Packaging Company by the 31st Bridge. Wilson is certified to grade proteins and has the knowledge to carve, debone and slice up a number of proteins like lamb, beef, chicken and of course, pork ribs. While Wilson Sr. boasts an abundance of culinary knowledge, he admits the secret behind his success is the fact “no one uses wood.” He bashes the idea of liquid smoke. Instead, he wills himself up every morning at 7 a.m. to get the fire pit going. “[My supplier] got a stack of wood for me almost taller than this building,” Wilson Sr. said. He’ll continue to feed the fire with hardwoods and fruitwoods like hickory, oak and peachtree until the oven reaches roughly 300 degrees. He’ll then start loading up the racks with slabs of ribs. 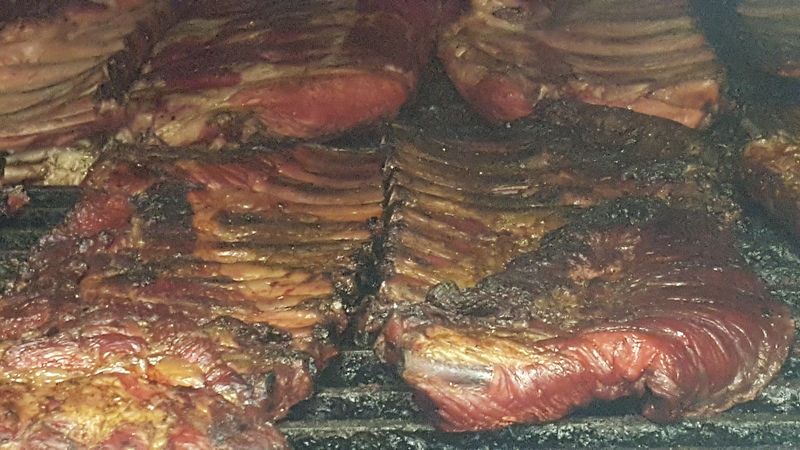 The oven has four racks that can hold up to 20 slabs of ribs. “When the steel mills were here I needed 60 slabs of ribs in there,” Wilson Sr. said. He admits the trick is to not cook “too fast.” He insists on finding the happy medium between tender, falling off the bone ribs and hearty, firm chunks of meat that are basked in the family’s famous barbecue sauce. “No one can duplicate it,” Wilson Sr. boasted. While Wilson Sr. admitted it is a tomato-based sauce (not a vinegar one), he wouldn’t disclose too much past that. He keeps the “formula” a secret, but is currently trying to pass down his grandfather’s recipe to his son and daughter, who are both looking to carry the barbecue torch. The sauce, which is city-renowned and in Wilson’s eyes the recipe “enhances the flavor” of whatever you pair it with. Wilson has sold 500-600 quarts of sauce a week to customers. While the tiny little corner restaurant is most well-known for their ribs, they also offer some savory chicken dishes. Along with the chicken, Wilson’s daughter has been providing a number of delicious sides to compliment the ribs, including pasta salad, potato salad, and the braised collard greens and hamhocks combination. The blue-collar mentality of Wilson and his family are what make their corner of Northside so special. Wilson has poured his heart and soul into this business and he’s managed to keep it all in the family, which is extremely important to him. He tried opening a second location in Lawrenceville years ago, but acknowledged that he couldn’t maintain the same level of consistency that he wanted to see his name attached too. “Do it right or don’t do it at all,” he said. There aren’t many destinations like Wilson’s left in Pittsburgh as the Wilson family has been offering honest service and great food for nearly 60 years, which some may call doing it right. Wilson’s Bar-B-Q is located on 700 N. Taylor Ave. and is open Monday-Saturday, 12-8 p.m. Call ahead at 412-322-7427. Wilson’s is a cash-only establishment.